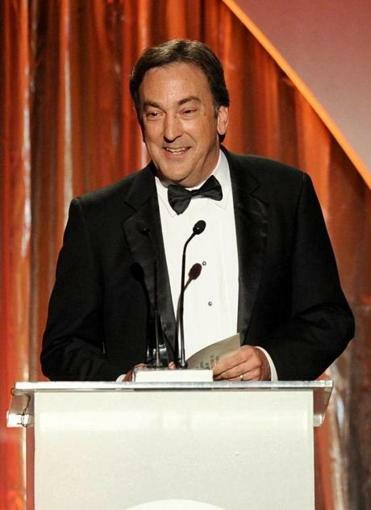 “Frozen” producer Peter Del Vecho accepted an award during the Producers Guild of America Awards on Jan. 19 in Beverly Hills, Calif. He earned a seat at this season’s Golden Globes, the Annie Awards for animation, and the upcoming Oscars, but producer Peter Del Vecho hasn’t always lived the glamorous life in Hollywood. Long before this red-carpet ride and the success of his latest project, Disney’s animated hit “Frozen,” Del Vecho was living on the South Shore, cheering for the Red Sox while attending Quincy High School and, later, studying theater production at Boston University. Nowadays, though, 55-year-old Del Vecho is part of the powerhouse Walt Disney Animation Studios. After working at Minnesota’s Guthrie Theater for 10 years, he joined Disney in 1995, starting out in production management and then switching to producing after familiarizing himself with animation. Del Vecho’s worked on several Disney projects, including “Treasure Planet,” “The Princess and the Frog,” and “Winnie the Pooh.” But the massive box office success of “Frozen” — the studio’s second highest-grossing animated film ever, after “The Lion King” — has made it the defining film of his career so far. “Frozen,” loosely based on Hans Christian Andersen ’s tale “The Snow Queen” and featuring the voices of actresses Kristen Bell and Idina Menzel, has already won a slew of accolades and is nominated for two Academy Awards. (Del Vecho won a Producers Guild Award for outstanding producer of an animated motion picture last month.) According to Billboard, “Frozen” has the longest-running No. 1 film soundtrack in the past 20 years. The popularity of the soundtrack has motivated Disney to release a singalong version of the film, and there’s been talk of turning the film into a Broadway musical. Despite all of his success, Del Vecho hasn’t forgotten his roots. He returns to the Boston area frequently, and often visits his sister, who lives on Cape Cod. He’ll be in town for the Red Sox season opener this spring, and after finishing promotion for “Frozen” abroad, Del Vecho plans to take it easy before diving into another project at Disney this summer.